Despite Palestinian and UNESCO efforts to remove the Jewish indigenous history in Israel, particularly Jerusalem, the evidence keeps showing up in archeological digs. It’s why Israelis want to keep digging, and Palestinians oppose any digging, particularly in the area of the Temple Mount and Western Wall. One seeks the truth, the other is afraid of the truth. During the recent UN General Assembly vote condemning Trump’s decision to recognize Jerusalem as the capital of Israel, Danny Danon, Israeli Ambassador to the UN, held up an ancient coin found during the excavations at the City of David in the Old City of Jerusalem (video here). A rare, well-preserved piece of clay dating to the First Temple period with the Hebrew inscription “governor of the city” was recently discovered during excavations by the Israel Antiquities Authority in the Western Wall Plaza in Jerusalem. “The Bible mentions two governors of Jerusalem, and this finding thus reveals that such a position was actually held by someone in the city some 2,700 years ago,” said Dr. Shlomit Weksler-Bdolah, excavator of the site on behalf of the IAA. The relic, dating from the 6th to 7th centuries BCE, was unearthed during a joint dig with the Western Wall Heritage Foundation in the northwestern section of the Western Wall Plaza…. Prof. Tallay Ornan of the Hebrew University of Jerusalem and Prof. Benjamin Sass of Tel Aviv University released a brief analysis after studying the sealing. “Above a double line are two standing men facing each other in a mirror-like manner,” they wrote. “Their heads are depicted as large dots, lacking any details. The hands facing outward are dropped down, and the hands facing inward are raised. The researchers added that the title “governor of the city” is known from the Bible and from extra-biblical documents, referring to an official appointed by the king. “Governors of Jerusalem are mentioned twice in the Bible: In 2 Kings, Joshua is the governor of the city in the days of Hezekiah, and in 2 Chronicles, Maaseiah is the governor of the city in the days of Josiah,” they noted. Jerusalem Mayor Nir Barkat said the find serves as a strong testament to the three millennia of Jewish presence in the capital. Continuing the attempts of the Israeli occupation to write an imaginary history of its control over the city of Jerusalem, it continues to talk about the artificial history of the temple and what it calls “its ancient history” in the city. Israeli Prime Minister Ehud Olmert’s spokesman for the Arab media, Ophir Gendelman, published photographs of relics that the Israeli Antiquities Authority allegedly found in excavations near the Al-Buraq Wall. The occupation claims that they confirm their “ancient history” in the city, and that the seals and artifacts date back to the period of the “First Temple” 2,700 years ago and to one of the “rulers of Jerusalem” mentioned in the Torah. The article proves again that Palestinian media isn’t objective. It is propaganda. The idea that Jews controlled Jerusalem, which Muslims freely admitted until recently, is now forbidden to be said. Because politics and hate of Israel is more important than facts or history. It’s a politically inconvenient historical truth for those trying to deny that Jews are the indigenous people in the area. The Palestinians have embraced The Big Lie as a propaganda technique, but the rest of the world does not have to believe them. Let me know when you are giving the Americas back to the indigenous peoples. There is unequivocal proof that all of the Americas was occupied. I am so glad you snowed up. Do you want me to show you man’s inhumanity to man? It didn’t take the whitem man to show up. Yup, and suppose the Cherokee were to move back to their ancestral home and start buying land to settle, only to be forced to defend themselves from white murderers, and thus ended up in control of, let’s say, the western third of Tennessee, and suppose they were to establish there a democratic state where the remaining white minority who’d agreed to keep the law had full rights, while those who refused to accept the new state had full civil rights but were not citizens. Would anyone think to condemn this Cherokee state and demand that it lay down arms and submit to the white settlers, or that it give the hostile white settlers an independent state which they could turn into a military base from which to keep on murdering Cherokees? I identify with the Cherokee. Pretty soon I’ll have so much scar tissue on my back there on’t be anyhere left to stick the knife. It always cracks me up when they deny and Israel presence. Who’w mosque is built on who’s temple mount? It always cracks me up when they deny any Israel presence. Who’w mosque is built on who’s temple mount? What cracks me up even more is that when the Arabs chant “Khaybar, Khaybar, ya yahud, jaish Muhammad sayud” is that they’re acknowledging the home of the Jews. Yahuda, or Judea in Arabic. Also, as a further aside, I don’t think they’d chant that if they knew how everything turned out. With a Jewish woman assassinating Muhammad with a poisoned sheep. But there I go again, imagining Muslims know their own historical narrative. Eventually it led to the Sunni-Shia split and centuries of internecine slaughter. The right kind of Muslims killing the wrong kind of Muslims. It’s why they won’t take over the world. It’ll be our secret. It’s cognitive dissonance. Like the way some of the same people who think we faked the moon landings also think the astronauts saw landed UFOs while they (the astronauts) were on the moon. This is political, of course, coming from the “Palestinians,” but it’s ridiculous. On the other hand, since the movement is now mostly a radical Islamist one, I note that many Muslims do not know their history and simply believe whatever the imams tell them. Wow, Jerusalem has always been the capital of Israel???? Well, not always. Only since 874 BCE. Milhouse: Well, not always. Only since 874 BCE. Well, there was that period of a couple of millennia of the Jewish diaspora. During which Jerusalem was still the nation’s capital city, the seat of the government it intended to establish as soon as possible. Milhouse: During which Jerusalem was still the nation’s capital city, the seat of the government it intended to establish as soon as possible. Meaning it was an aspirational, not a de facto, capital. It was the only capital the nation had. It was as much the capital as Warsaw was the Polish capital during WW2, when the government was in exile. excepting, of course, the 5 centuries or so when it was a Roman/Byzantine city named Aelia Capitolina, the name of Jerusalem was banned, and no Jews were allowed to set foot inside it. Somewhat ironically, it was the Arab conquest that allowed Jews to return. They appear to have referred to the city as “Ilya” for a few centuries, a contraction of “Aelia”. The name “Jerusalem” didn’t come back until the Crusaders charged in, slaughtered every Jew and Muslim they could find in the city, and made it the centerpiece of their new Kindgom of Jerusalem, a strictly christian entity. Here’s how: Everyone knows that Donald Trump had Barrett make this in his private art class last month, and then he had Jarrett take a red-eye flight to Israel, where, with Bibi’s connivance, he snuck onto the archaeological dig site and hid it where the archaeologists would dig it up! Because he’s sneaky that way!!! To add to tarheelkate, “I note that many Muslims do not know their history AND QURAN, and simply believe whatever the imams tell them. You have that right, mochajava. Most Muslims cannot read the Qur’an in anything more than a superficial way, since it’s in classical Arabic, which no one speaks any more. Many Egyptian Muslims I knew when I lived there were mostly uninformed about their long-range history and even about their near-term history. Most Muslims cannot read the Qur’an in anything more than a superficial way, since it’s in classical Arabic, which no one speaks any more. And it’s officially not supposed to be translated into any other language. And here I was thinking I was the only one thinking that. Hey, stop me if I’m wrong, but isn’t that a Quran? On that relief, if you look to the right behind the crossed trumpets, you can see the Holy TeeVee set with rabbit ear antenna on top. I believe you have a point. Even people who don’t like you have to admit you were there first. Shakily raises his hand, after descending from the people who destroyed your temple in 70A.D. OK, I’ll let you in on a secret. A lot of water has passed by the hull since my people crucified Christ. And I’m over it. Besides, you taught me Krav Maga. Hum… another relic from the past missed by the Muslim clean up squad. Can’t have any left over evidence of Jews being in the Promised Land before “The Perfect Man” (PBUH… for else) shows up. You’re Italian? Actually, the Romans crucified Christ. However, the Sanhedrin broke Jewish law to find Christ guilty of heresy. As for the crowd and Pilate… In the big picture those three intersecting events were already set in motion to happen. That “Christ killer” garbage over the ages is the stupidest dogma I can personally think of. I’m Italian. But I don’t know if I’m Roman. Because here’s the deal, dadio. My family comes from Campania which was home to most of Rome’s slaves. Good point. The big (positive) thing in Australia was having “convict blood” heritage as a point of honor. Would be interesting to know the past? Campania (really all of Magna Graecia) had a large Jewish population until it came under the power of the Spanish Inquisition in the early 16th century, and all the Jews either left or went underground. Recently a lot of families in the area have discovered that there was a secret family tradition of Jewish ancestry. So you never know. William A. Jacobson: It’s a politically inconvenient historical truth for those trying to deny that Jews are the indigenous people in the area. There were people living there before Abraham. In any case, the Jews and Palestinians both have ancient roots in the area, being closely related through the male line. The people living there before Abraham are long gone, just like the people living in North America before the Indians, and are thus irrelevant. Jews are the indigenous people; “Palestinians” are almost all Arab immigrants, mostly from the 19th and 20th centuries. If by indigenous you mean “first people”, then no — even if they wiped everyone out, which they didn’t. Not according to the Bible, and not according to genetics. That would be like saying an English descendant in Brooklyn is indigenous. Milhouse: “Palestinians” are almost all Arab immigrants, mostly from the 19th and 20th centuries. 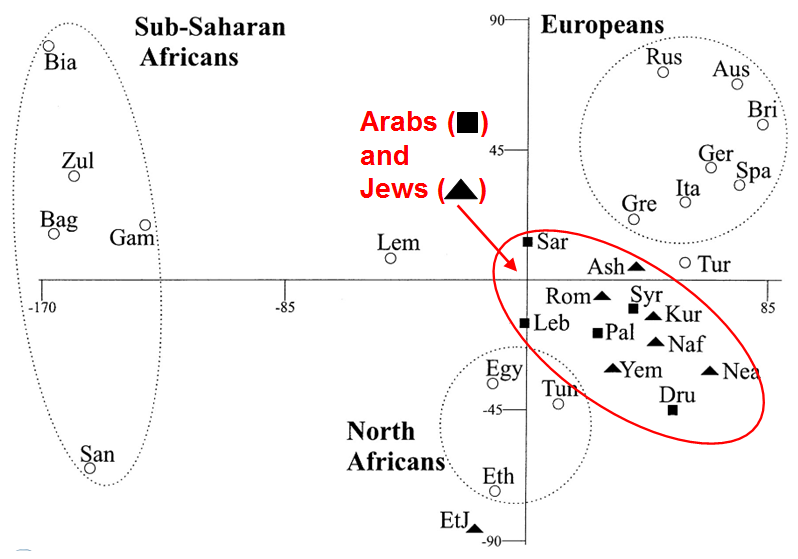 The genetic evidence is that Jews and Palestinians share a closer male ancestry than either do with neighboring Arab groups, and that they diverged in the late Neolithic. By that definition there are probably no indigenous people anywhere. Certainly not in the Americas or Australia. I doubt the authenticity of whichever study you’re referring to, unless its subjects were carefully chosen and thus not representative of the whole “Palestinian” population. Milhouse: By that definition there are probably no indigenous people anywhere. Certainly not in the Americas or Australia. Not sure why you say that. The original inhabitants of the Americas and Australia have almost certainly left descendants. Genetic studies of pre-Columbian remains indicates that natives of the Americas descended from a single population that migrated from Beringia. See Hammer et al., Jewish and Middle Eastern non-Jewish populations share a common pool of Y-chromosome biallelic haplotypes, PNAS 2000. The study shows that Jews of the Diaspora share a close male genetic relationship with the peoples of the Middle East, including with Palestinians, solidifying their connection to the region. (Whole genome and maternal genetic studies are more ambiguous.) This is consistent with the Biblical stories of the sons of Abraham, Isaac and Ishmael. …a single population that migrated from Beringia. and pushed out the previous inhabitants. Ditto for Australia; the Aborigines came about 10K years ago, and pushed out the previous inhabitants. “Peoples of the Middle East”, yes. But I am very skeptical of any study that shows a unified “Palestinian” DNA, since they’re a hodgepodge of migrants from Egypt, Arabia, Syria, Bosnia, and several other places. Milhouse: and pushed out the previous inhabitants. What evidence is there of inhabitants previous to the Beringians? Well, skepticism is fine. That’s why we provided evidence. However, being ‘skeptical’ in the face of evidence regardless of the content of a study isn’t skepticism, but handwaving. Palestinians are hardly a single unified group, any more than Jews or Arabs or Irish are a single unified group. Every sub-population is an admixture. However, the evidence from the male chromosome is that, as a group, Palestinians show a close relationship to Jews and therefore indicate a common regional origin, are distinct from Arabs, but with some Arabic admixture. You haven’t cited any such studies. You’ve only mentioned ones that find a link to “middle eastern” people, not to “Palestinians”. That accords well with the known history that Jews come from the Middle East. But any study that purports to find that there is such a thing, demographically, as a typical “Palestinian” genome, and that it’s more closely related to Jewish genomes than to other Arabs, should I think be treated with extreme skepticism. How many studies make such a claim, which flies in the face of the known history, and who claims to have conducted them? Milhouse: Kennewick Man, for one. Kennwick man is only from 9000 years before the present, so would post-date Beringian occupation. In any case, genetics reveals that Kennewick man is closely related to other native Americans living in the region. See Rasmussen et al., The ancestry and affiliations of Kennewick Man, Nature 2015. Milhouse: You’ve only mentioned ones that find a link to “middle eastern” people, not to “Palestinians”. That is incorrect. Hammer et al. specifically included Palestinians as a subgroup in their analysis. This diagram is from the study (the key and circle were added). Note that patrilineal Palestinians nestle in the midst of Jewish populations. This also shows that Jews have roots in the region. Isaac and Ishmael are of the same patrilineage. Maybe I am Jewish. I have an unnatural fondness for Hava Negela. Or maybe I’m a ghurka. Yes, I spelled it wrong. The facts that matter are that the Jews are there, they are not going away, they have the upper hand, they are willing to make peace and the Palestinians, who have played a stronger hand stupidly, are unwilling to make peace on any terms the Israelis can possibly accept. The Palestinian leadership prefers to milk victim status for all it’s worth. The ancestors of today’s Jews were there and in power for a very long time, a very long time ago. This has little significance one way or another. I am only going to decide one matter at a time. He proposes a very interesting theory on the timeline for the Exodus, and other biblical narratives based on the archeological evidence uncovered to date. I think you would find it fascinating. Most American school children learn about the indigenous who were here first: where they came from, where they settled, their societies, customs, etc. We do not deny they were here first. They and other Americans do archaeology at their historic sites not to deny their existence here first, but to learn more about it.